Monday, April 14, 9 a.m. Because of its eccentric orbit, Mars will be at its closest to Earth today, almost a week after opposition on April 8. This is an unfavourable opposition, Mars being only 15.1 arc seconds in diameter. Later today, the almost Full Moon will pass just north of Mars. Last week, the solar system put on quite a show. An alignment of Earth, moon and sun produced a rare and spectacular blood-moon lunar eclipse . 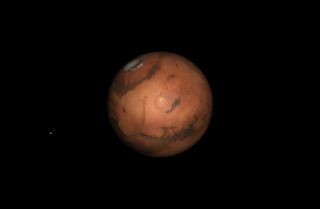 In addition, Mars made its closest approach to Earth since 2007. And just as Mars drew tantalizingly near to Earth, NASA is drawing closer to its goal of a human mission to the Red Planet . This week, April 22-24, NASA joins with the nonprofit group Explore Mars and more than 1,500 leaders from government, academia and business at the Humans to Mars (H2M) Summit 2014 at George Washington University. There, participants will discuss the value, challenges and status of America's path to Mars. While NASA began its march to Mars decades ago with the earlier Mars rovers and orbiters, President Obama made a critical national policy statement in support of NASA's strategy on April 15, 2010. During a visit to Kennedy Space Center, the president challenged the nation to send humans to an asteroid by 2025 and to Mars in the 2030s. Since then, NASA has been developing the capabilities to meet those goals through a bipartisan space exploration plan agreed to by the administration and the U.S. Congress, and embraced by the international space community. While humans have been fascinated with Mars since people first looked to the skies, there are a number of very tangible reasons why humanity needs to learn more about its closest planetary neighbor. For one thing, Mars' formation and evolution are comparable to Earth's, and scientists know that at one time Mars had conditions suitable for life. What NASA learns about the Red Planet may tell humanity more about its own home planet's history and future, helping to answer a fundamental human question — does life exist beyond Earth? While robotic explorers have studied Mars for more than 40 years, NASA's path for the human exploration of Mars begins in low-Earth orbit aboard the International Space Station (ISS), the springboard to the exploration of deep space. Astronauts aboard the ISS are helping NASA learn how to safely execute extended missions deeper into space. The Administration's commitment to extend the ISS until at least 2024 guarantees access to this unique orbiting outpost for at least another decade. That means an expanded market for private space companies; more groundbreaking-research and science discovery in micro-gravity; and opportunities to live, work and learn in space over longer periods of time. The next step is deep space, where NASA will send the first mission to capture and redirect an asteroid to orbit the moon. Astronauts aboard the Orion spacecraft will explore the asteroid in the 2020s, returning to Earth with samples. This experience in human spaceflight beyond low-Earth orbit will help NASA test new systems and capabilities, such as Solar Electric Propulsion, — wthat the agency will need to support a human mission to Mars. Beginning in 2017, NASA's powerful Space Launch System (SLS) rocket will enable these "proving ground" missions to test new capabilities. Human missions to Mars will rely on Orion and an evolved version of SLS that will be the most powerful launch vehicle ever flown. NASA has already sent a fleet of robotic spacecraft and rovers on and around Mars, dramatically increasing knowledge of the Red Planet and paving the way for future human explorers. The Mars Science Laboratory Curiosity rover measured radiation on the way to Mars and is sending back radiation data from the surface. This information will help the agency plan how to protect the astronauts who will one day explore Mars. Future missions, like the Mars 2020 rover seeking the signs of past life, will also demonstrate new technologies that could help astronauts survive on Mars. Engineers and scientists around the country are working hard to develop the technologies astronauts will use to one day live and work on the Red Planet, and safely return home. Meanwhile, the Humans to Mars Summit this week brings together the best minds to share ideas about the path ahead. NASA will be leading the charge. It is important to remember that NASA sent humans to the moon by setting a goal that seemed beyond reach. In that same spirit, the agency has made a human mission to Mars the centerpiece of its next big leap into the unknown. The challenge is huge, but NASA is making real progress today as a radiation monitor on the Curiosity rover records the Martian radiation environment that future crews will experience. Meanwhile, advanced entry, descent and landing technologies needed for landing on Mars are ready for entry-speed testing high above the waters of the Pacific Ocean in June. Orion is finishing preparation for a heat shield test in December, and in New Orleans we're beginning to manufacture flight hardware for the heavy lift rocket necessary for Mars missions. The future of space exploration is bright, and NASA is counting on the support of Congress, the scientific community and the American people to help realize those goals. For more information on the Humans 2 Mars Summit 2014, visit: http://h2m2014.exploremars.org/.